Have you ever taken a look at the ingredients in your dog’s treats? Usually, there are several that are hard to pronounce. Maybe what’s in the dog treats doesn’t concern you as much as the price does. There is an alternative to high-priced dog treats that have a lot of questionable ingredients in them. Make dog treats yourself. It’s simple! One benefit of homemade dog treats is you know exactly what’s in them. Plus, you probably have a lot of the ingredients already in your kitchen. I have a homemade dog treat recipe that my mother-in-law gave me that my dogs love. Both of my dogs go nuts over these treats when I make them. 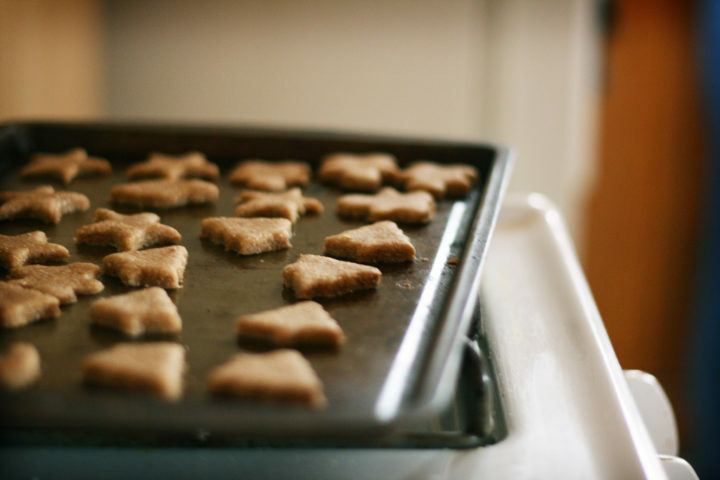 The ingredients in these homemade dog treats are even safe enough for a person to eat! Preheat oven to 300 F. In a food processor or blender, grind the oats. In a large bowl, mix together the oats and flour. In another bowl, stir together peanut butter, oil, milk, and water. Add egg and stir. Begin adding dry ingredients (1 cup at a time) to liquid mixutre. Stir until blended. Roll out dough on well-floured surface. Cut into strips. Using your fingers, push the ends of the strips down slightly, forming the strips into bone shapes. Bake 1 hour on a greased baking sheet. Cool before storing in an airtight container. Makes about 20 dog treats. We don’t put them in bone shapes. We just put different sized pieces on the cookie sheet.